One of the easiest features of Enhanced Ecommerce with Google Analytics to use is the ability to view behavior funnels. These funnels are intended to give you insight into the shopping and purchasing experience in your eCommerce store, showing you were customers enter and leave the shopping or purchasing processes. 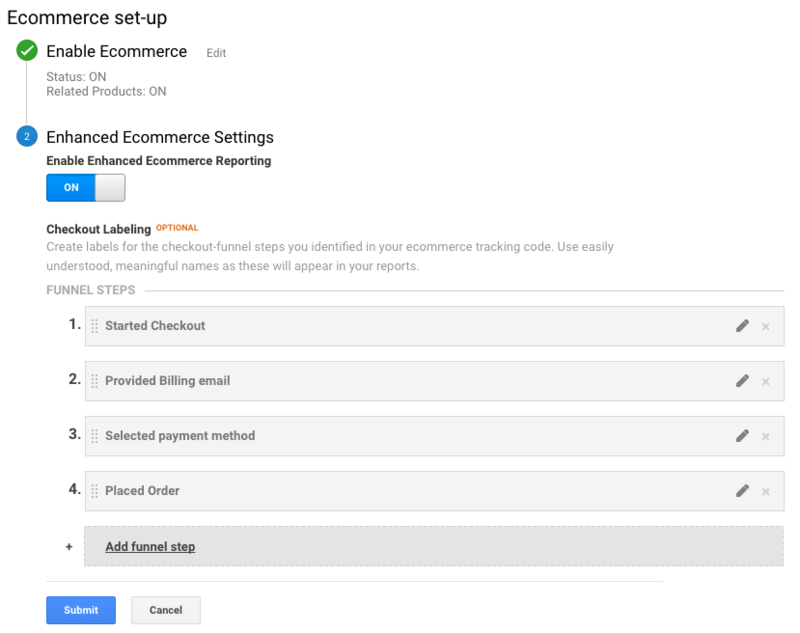 We’ve drastically improved support for these funnels in WooCommerce Google Analytics Pro version 1.3.0+, ensuring that Shopping Behavior and Checkout Behavior reports will populate without any additional effort as soon as you’ve connected your site to Google Analytics. Let’s take a look at what each of these reports can give you once you upgrade the plugin. You can evaluate your users’ shopping experience from product impression to transaction. 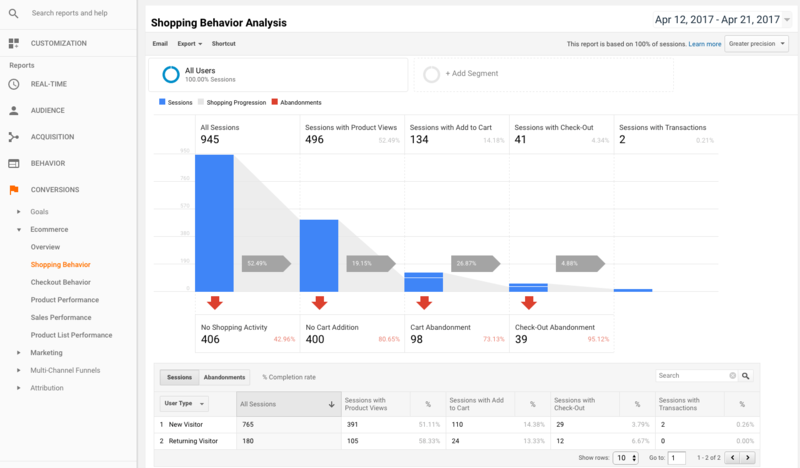 You’ll be able to see where visitors enter and leave this funnel, giving you insight into abandonment and where drop-offs occur in your purchasing lifecycle. You can view this report by going to Conversions > eCommerce > Shopping Behavior to see data on all browsing sessions in your store. You can drill down even further to create segments based on these behaviors. For example, if you click the “Cart Abandonment” footer, you’ll see that you can create a segment, or “view” of only users who have left your shopping funnel. 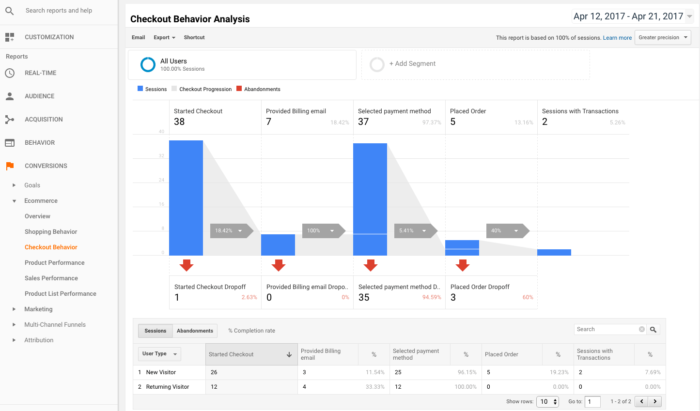 This lets you gain further insight into the behavior of customers who leave your site vs customers who purchase. Now what about that final touch point in purchasing — your checkout process? The Checkout Behavior report gives you more detailed insight into what happens during the actual checkout. This report is typically most useful for stores with a multi-step checkout process. However, WooCommerce favors a single-step checkout for simplicity, so this report may not be as relevant to merchants. These 4 events will happen for most any WooCommerce checkout, regardless of whether selling physical goods, shippable goods, or other products. 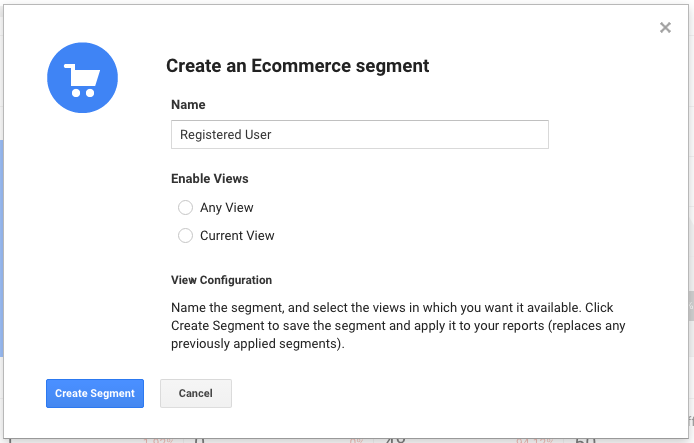 While you can’t control the steps in this funnel, you can control names of the steps and how they appear in your Google Analytics account. Once configured, you’ll see this report populate with where customers get to in your checkout process, along with seeing which events are done first (where they enter the funnel). This lets you see where potentially drop-offs are in your checkout, allowing you to determine if some parts of checkout need to be more prominent or easier to complete. The Checkout Behavior analysis also allows for “checkout options” to be sent, which are sent for 3 of the 4 events in this funnel. These options can be used to create segments to track users based on choices they may have made. For example, let’s say you want to filter by the first checkout option: whether registered or a guest user. You could click on this checkout option to create a segment. You’ll then be able to use this segment to filter the users who have passed through your funnels or browse your site, looking deeper at their behaviors. 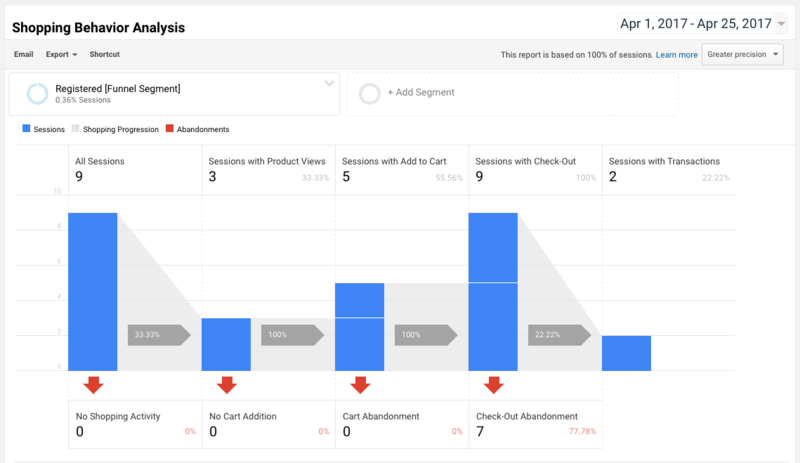 Each of these funnels will begin to populate as soon as you connect the plugin to your Google Analytics account, letting you see more detail about customer behaviors on your site, and giving you an initial look into cart and checkout abandonment. Here is one hack that I found particularly useful! When I’m categorizing things, I often give my list generic name so that I don’t make it too messy when I try to go in and spot particular trends with our products.